Fun-sized bites of Trouble! 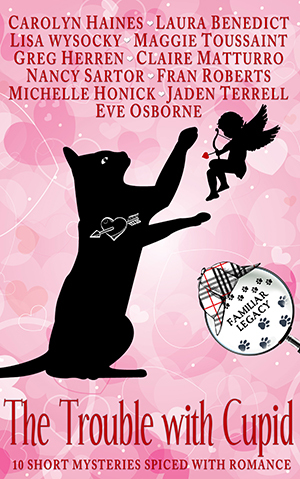 All proceeds from the sale of THE TROUBLE WITH CUPID will be donated to Best Friends Animal Sanctuary. 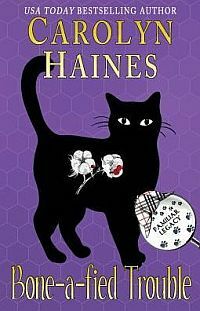 The famous black cat detective from Wetumpka, Alabama is at it again in this collection of sometimes poignant, often amusing short mystery tales. Bestselling authors Carolyn Haines and Laura Benedict lead the lineup with the sassy “Calling All Cupids” and the sweet “Of Mice and Munchkins,” followed by Claire Matturro’s heartwarming contribution, “The Madonna in the Garden.” With additional stories by eight other authors, including critically acclaimed veterans and exciting new talents, THE TROUBLE WITH CUPID is a delightful offering of wicked fun for anyone who loves mysteries, cats, and a touch of romance.